A really good baking anime I love how the characters develop and how funny it is! The main character is so sweet and has an incredible palate/taste you have to watch this . All the fluff! You won't regret watching!! When I first started watching this anime, I was kind of reluctant to watch it. I never heard of it until I was looking at cooking anime recommendations. I was suspicious but I had time on my hands and the summary was interesting enough to make me check it out. Oh boy, am I sure glad I did because I enjoyed every moment of watching this. This anime was just pure fluffiness and it had that bold sense of creating your own path, which was a wonderful journey to behold. The writing was magnificent and the characters well-developed. Almost all your questions you have will be answered and it feels complete despite wanting more of it once you finish it. 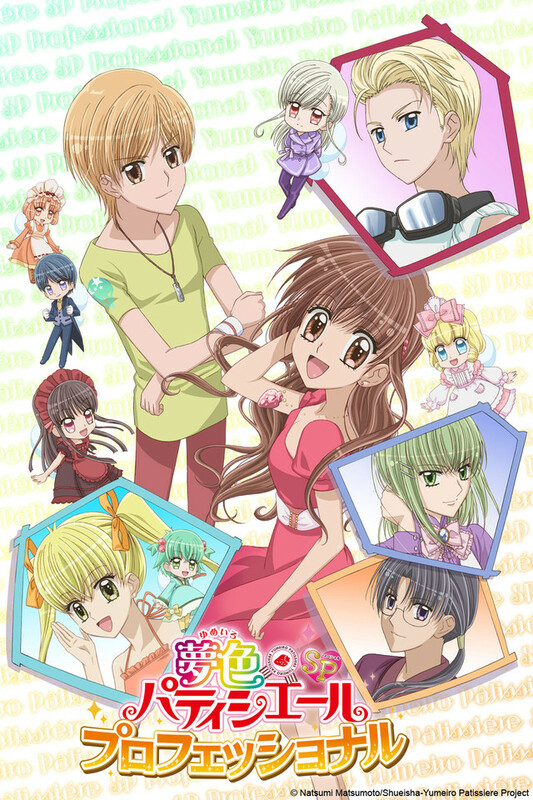 There is always the Manga series and the short 13-episode long second season called "Yumeiro Patissiere Professionals" if you ever have the chance to get to them. I admit 50 episodes is quite a large quantity of episodes to watch but keep in mind you don't have to watch them all of them in one sitting (exactly what I ended up doing), a few episodes a day will do. Since some of the storylines feel too long you can always come back to it later when you get tired. Also, fair warning that the sweets these characters will make you drool so eat beforehand or have some snacks handy! Hope you decide to watch it! WHAT THE HECK. the tittle appeared, but not the episodes... i really wanted to watch this... and why do i have to have a certain amount of characters to write a review. Does anyone else find that really weird for a review, like that's pretty lame. I love yumeiro patissiere!! I watched season 1 to season 2. It is awesome you should watch it. If you watch it you will be loving it so watch it. Its the best anime I had watched! The main charter is Amano Ichigo and her Sweet Spirit. I love this cute and inspiring anime. The writing and dialogue and plot and story are pretty great. If it weren't for this show I wouldn't have taken a huge step forward and started following my dreams to be a pastry chef. I <3 THIS ANIME BUT. TBH i would of liked to of seen how Ichigo & Kashino became so close instead of skipping it and in my opinion it could of been season 2 with them studying in paris and season 2 could of been the 3rd..
more romancy if you cant tell by the intro! ^w^ oh yea, it's a MUST watch! I love this series! It's funny and sweet! I had a great time watching yumeiro patissiere. It's the best so far, for me. It isalso my F-A-V-O-R-I-T-E! It would be great if they made a third serie. I get so excited when I watch this serie.